Almost half of the world’s population uses the internet and 75% of those people are active social media users. That number is equivalent to over 2.3 billion people who use social media on a regular basis. The majority of consumers also admit to relying on social media and their friend’s social media posts when making purchasing decisions. Social media is taking word of mouth to a whole new level. Once you’ve decided on your concrete goals, make them measurable. Do you want to increase your website traffic by 35%? Do you want to get 1,000 new page likes a week? Can you get 100 shares of your content per day? You could create multiple profiles if you have a variety of customers. From here, it will be easier to decide which social channels to concentrate on, based on the typical users on each. For example, if the primary user of Twitter is teenagers, but your average customer is a baby boomer, you probably don’t want to expend too much energy on Twitter. Many businesses report that one of their largest challenges in social media marketing is tying their activities on social media to their business goals. When formulating your strategy, you’ll also need to decide how likes and shares and increased website traffic will improve your bottom line. You’ve already considered who your target customer is and what social channels to use, so now you’ll need to decide on a content plan that will achieve your business goals. Not only does it need to align with your messaging and be relevant to your audience, it also needs to be engaging, valuable and shareable. In order to know what will appeal to your audience, you could look to your competition for information. Learn from what works for them and what hasn’t through the customer engagement on their channels. If Facebook is one of your social channels (and it should be! ), there are ways to tie back your business to your content using features like conversion pixels and URL shorteners. Gaining customers through social media is a matter of a trusting relationship. Your business’ social media accounts are there to build a community of like-minded people who like or love your brand. It is a spot where they can engage with the company and with others, but if you don’t have the right trained staff to engage back, you could be missing a crucial piece of the puzzle. Not responding to messages or tweets is a killer when it comes to your social media marketing and companies are mishandling up to 80% of customer engagement opportunities. With almost ¾ of consumers saying that they are more likely to recommend a brand after having a positive social media response, this is an opportunity that shouldn’t be taken lightly. Having staff who know how to engage your customers on social media is paramount to your success as a company. Many companies are hiring social media consultants, but training all of your staff may be the ticket to increasing brand awareness and increasing employee engagement. Facebook, Twitter, Google, LinkedIn and Pinterest all have built-in analytics servers but you can also find a third-party social analytic tool, some that are free and some that have a small fee. 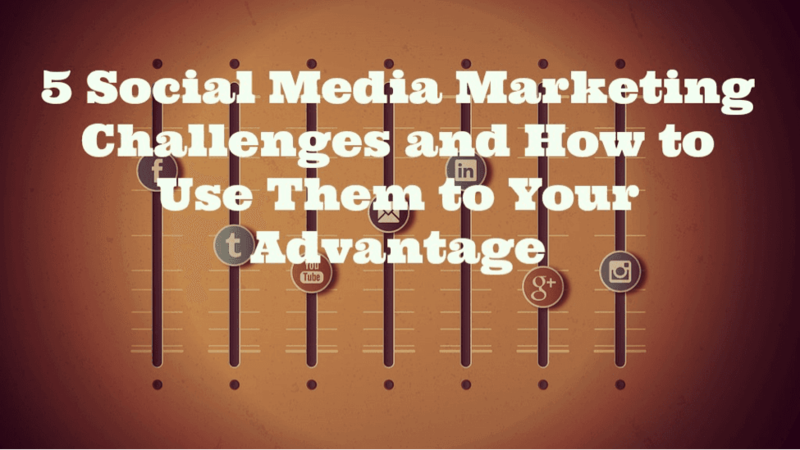 Overcoming social media marketing challenges is possible with a little work and analytic thinking. Changing and tailoring your strategy based on the newest data will keep your marketing fresh and engaging.